Today’s weekly demo against the Apartheid Wall in Bilin saw some rare but welcome wet and overcast weather. Instead of the usual midday sun, clouds and drizzle accompanied the marchers on their route from the village mosque to the wall. The wet weather had the opposite effect of keeping people away as the numbers were higher than recent weeks. 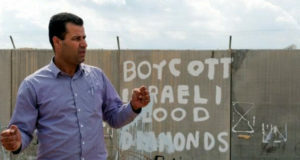 The demo had the usual international flavour with villagers supported by international and Israeli activists. Polish and Spanish solidarity groups stood out today. As usual units of soldiers occupied a rooftop and lurked on the edge of the village. Marchers chanted slogans urging Palestinian leaders to end internal conflict and unite against the Israeli occupation. On reaching the gate in the wall the marchers, many of them waving olive branches, found their route blocked by soldiers lined up in front of the gate. As some villagers went under a railing they were grabbed and dragged away by soldiers. The protesters then walked downhill alongside the razor wire which some pulled at and others trampled with olive branches. More units of soldiers were immediately dispatched to this area and a sound bomb was fired. Many protesters were grabbed and shoved roughly by the soldiers, sustaining cuts and bruises. 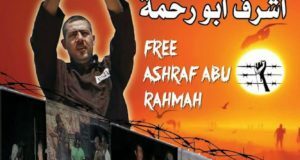 One protester managed to climb through the fence in an act of defiance but he quickly returned to the other side for fear of repercussions – many Bil’in villagers have had to spend days in prison after demos when they have tried to access their land on the other side of the wall. 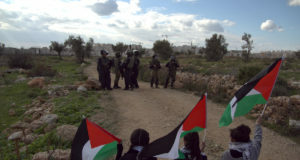 As the demo was continuing the soldiers in the villages were firing tear gas and shooting rubber bullets at children. Four children suffered serious enough injuries to need hospital treatment in Ramallah.